On this World Food Day, the Centre for Human Rights Education, Advice and Assistance (CHREAA) and the Southern Africa Litigation Centre (SALC) call for radical and urgent reform of the prison system to stop the systemic torture-by-starvation of Malawi’s prisoners. 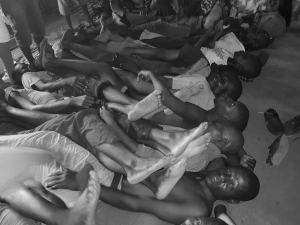 While all human beings have a right to access adequate food for their survival and health, the situation of prisoners is a startling indictment on Malawi’s constitutional protection of human rights. A 2017 study showed that despite high levels of poverty, most people in Malawi are able to access three meals a day, albeit in varied quantities and quality. “Practically all” prisoners, however, are food insecure and subsist on only one meal a day. Over the years, it has often been reported when prisoners go for days and even weeks without food when procurement, cooking or electricity problems strike. Image: A typical meal in the prisons of unfortified maize meal, sometimes served with beans or peas. The 2017 study showed further that amongst inmates there is significant food inequity. Inmates are reliant on families to supplement their diets. Those whose families are estranged or (more often) too far away or too poor to bring them food, experience greater hunger. 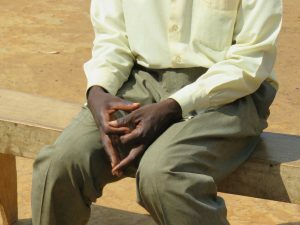 In the case of Mr Abyuthi Phiri, reported earlier this year in the Blantyre Post and in a video produced by CHREAA and SALC, his inability to access adequate food in prison led to his starvation, the development of malnutrition-related psychosis, and his eventual death – just months after entering the prison a healthy, young man. Families are not only burdened with subsidizing their loved one’s imprisonment through bringing food that the State is failing to provide, but they are also left with the consequences of malnutrition and starvation when loved ones in detention become sick or die. Image: The brother of the late Abyuthi Phiri discussing the death of his brother by starvation in Maula Prison. While there are higher rates of both HIV and TB in prisons, malnutrition severely compromises the effectiveness of HIV and TB treatment and can exacerbate the development of TB disease. While we often imagine prisons to be separated from communities, they are in fact, from a public health perspective, deeply embedded in our communities. People move in and out of the prison over time, including inmates and people who work in and visit the prisons. When health in a prison is compromised by poor nutrition, that sickness is shared with communities and in families. 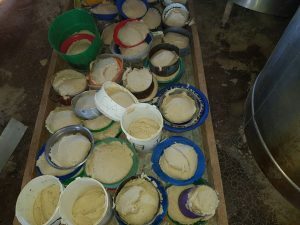 The problem with food insecurity in Malawi’s prisons is also directly linked to its growing prison population and inhumane levels of congestion. A recent study has shown that with projected rates of prison population growth, the corollary growth in food demand will be too big for the prison service to meet in a few years’ time, even at the moderate levels currently provided. If we do not address overcrowding in the prisons, starvation, sickness and climbing expenses in the prisons will continue to deplete Malawi’s progress. Image: Congestion in Malawi’s prison leaves some inmates with as little as 0.1m2 per person when in their cells. While section 42 of the Malawi’s Constitution guarantees all persons in detention the right to be held in conditions consistent with human dignity, including access to adequate food, it is an open secret that the State has failed and continues to fail to meet these standards in the prison. If not by virtue of the fact that prisoners are humans who are entitled to the enjoyment of human rights, the cost of systemic starvation in the prisons from a public health perspective and its drain on families should justify the necessity for reform.